If you’re lucky, valuable fruit in high demand could be growing in a tree on your property. Per acre, a pawpaw orchard has the potential to produce an annual gross income of $50,000, including $15,000 per acre for fresh fruit, $30,000 per acre for frozen pulp, and $5,000 an acre for seed and scion wood. Due to the pawpaw’s enticing taste and untold culinary possibilities, it is in high demand by brewers, consumers, chefs, bakers, ice cream manufacturers, and fresh fruit purveyors throughout Ohio. Pawpaw production has been researched on a small-scale at the OSU South Centers in Piketon since the 90’s with small acreage observation and demonstration trials. In 2018, Marketing and Orchard Resource Efficiency (MORE) Ohio Pawpaw, a new statewide, grant-funded project spearheaded by Principal Investigators Brad Bergefurd, a horticulture specialist with OSU Extension, the outreach arm of CFAES and Dr. Matt Davies, an assistant professor in CFAES, were awarded funding for this research and education project thanks to a USDA and Ohio Department of Agriculture Specialty Crop Block Grant. Pawpaw trees, the largest edible fruit trees native to North America, grow from the Great Lakes down to portions of the Florida Panhandle with Mid-Atlantic and Midwestern states making up the predominant growing region. Pawpaw trees produce greenish-blackish fruit, usually three to six inches long. The flesh is pale to bright yellow and contains a network of glossy, dark brown seeds. A pawpaw’s flavor is sunny, electric, and downright tropical: a riot of mango-banana-citrus that is incongruous with its temperate, deciduous forest origins. They also have a subtle kick of a yeasty, floral aftertaste somewhat like unfiltered wheat beer. “The flavor of pawpaws is forceful and distinct,” wrote culinary historian Mark F. Sohn diplomatically in his encyclopedic book, Appalachian Home Cooking. The members of the Lewis and Clark expedition ate pawpaws for pleasure, and, for a period in Missouri in 1806, subsistence. Our early American ancestors enjoyed pawpaws for centuries, spreading them as far west as Kansas. In 1541, the expedition of conquistador Hernando de Soto recorded Native Americans growing and eating pawpaws in the Mississippi Valley. Even though they had to clear pawpaw trees to create farmable land, white settlers savored pawpaw fruit —often the only fresh fruit available nearby. Want to try some pawpaw fruit? Ask around at your local farmers market, where pawpaw fruit may show up around August, September, or early October. It is not cheap, but you can have fresh pawpaw fruit shipped to you in season, and frozen pawpaw pulp year round. The specialty foods company Earthy Delights says that requests for pawpaws have gone up every year since National Public Radio first aired a story about them in 2011. You can also go directly to the source and contact other regional growers and gatherers, who may be selling both frozen pulp and mixed fruit. Can’t find fresh pawpaw fruit? Drink beer! Pawpaw-flavored craft beer is popular among Ohio craft beer enthusiasts and is perhaps one of the most accessible ways pawpaws have been brought to the people. Breweries such as Weasel Boy Brewing in Zanesville, Sixth Sense Brewing in Jackson, and Jackie O’s Brewery in Athens are just a few Ohio craft breweries using pawpaw in specialty craft brews. 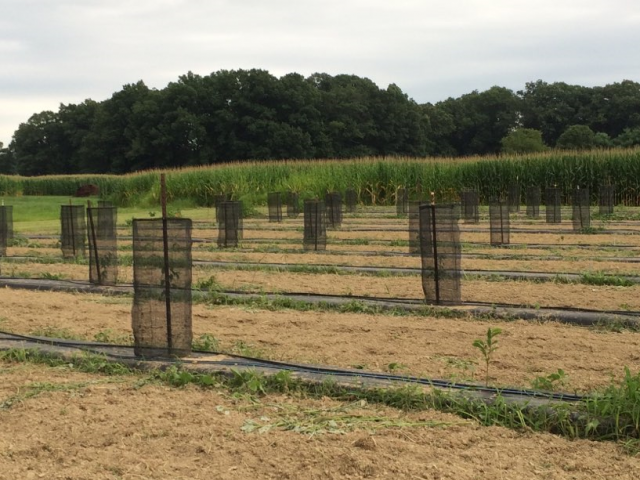 To acquire unbiased, research-based information to help grow the Ohio Pawpaw industry, over two acres of research orchards and native woodland research trials have been established on the Columbus and Piketon campuses of OSU. Pawpaw information from this and past years trials and from the Ohio Pawpaw Growers Association can be found on the projects web site at southcenters.osu.edu/horticulture/fruits/pawpaws, or to receive information on upcoming pawpaw trainings and field days, subscribe to the email list at go.osu.edu/horticulturelistserv or contact Brad Bergefurd at Bergefurd.1@osu.edu or call him at the South Centers.